Homeaway, the world’s largest collection of homes, villas and condos, is using the 2010 Super Bowl to launch an integrated advertising campaign, “Hotel Hell Vacation”. The characters from National Lampoon’s Vacation (American Vacation), Clark and Ellen Griswold, and their children Rusty and Audrey, first appeared in 1983, played by Chevy Chase, Beverly D’Angelo, Anthony Michael Hall and Dana Barron. The family went on to make European Vacation, Christmas Vacation and Vegas Vacation. Now it’s time for Hotel Hell Vacation, a chance to convince the American public to forget about hotels and motels. The campaign is online at homeaway.com, with exclusive Griswold video content, the Griswold Getaway game featuring the Family Truckster, and a contest to turn a hotel hell story into a dream vacation. The Super Bowl spot reunites actors Chevy Chase and Beverly D’Angelo in their roles as Clark and Ellen Griswold in a mock movie trailer giving a sneak peek of a short film. Additional airings of the commercial will appear during programming on media partners secured by media agency Optimedia, including the Travel Channel, Discovery Channel, HGTV, TBS, USA Network, and Food Network. In the 15 minute Hotel Hell Vacation film, Clark surprises Ellen with a romantic second honeymoon before meeting up with their son Rusty and his family for an extended vacation. In classic Griswold family tradition, they run into plenty of travel mishaps along the way. A complementary digital advertising plan will reach consumers in HomeAway’s targeted demographic, with online advertising appearing on general interest and travel-focused web sites, including About.com, Condé Nast Traveler’s concierge.com, iExplore, Yahoo! and Google. HomeAway is also leveraging social media to spread the word about the campaign, using Facebook and Twitter accounts for consumers to follow and interact with Clark Griswold. 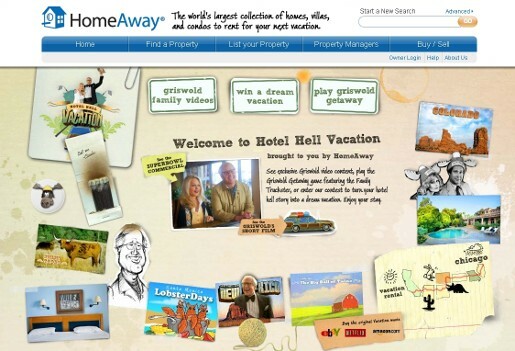 HomeAway created a Hotel Hell Vacation-branded microsite for the campaign, which features exclusive video content (mock movie trailer commercial, the full Hotel Hell Vacation film, and special scenes from the original “National Lampoon’s Vacation). A user-generated content contest, with $40,000 in prizes, invites consumers to share stories of hotel horrors in the form of a text, photo or video entry for the chance to win one of four $10,000 family vacations at a HomeAway vacation rental. Participants may enter any of four themed categories, including “Outrageous Hotel Bills,” “Cramped Hotel Quarters,” “Wish I Had a Kitchen,” and “Other Hotel Woes,” beginning Feb. 7. The public will be invited to vote between March 2-9 for the best stories, and winners will be announced in mid-March. The ‘Griswolds Getaway’ online game invites players to try their hand at stacking luggage on top of the Griswold’s Wagon Queen Family Truckster. As luggage falls from the sky, players have to grab and stack the different items while avoiding flying obstacles that can knock the luggage off the top of the car. Players, and the Truckster, journey through five tricky levels (including a stop at Cousin Eddie’s house) to the final pay-off at a spacious vacation rental. Players may share the game with friends through e-mail and Facebook on the microsite. HomeAway plans to take its exact replica of the Family Truckster on the road in spring to visit popular vacation destinations to further spread the word about the benefits and value of vacation rentals. Through a promotional licensing agreement with Warner Bros. Consumer Products, the company has use of the “National Lampoon’s Vacation” property. The Hotel Hell Vacation campaign was developed at Publicis in the West, Seattle. Filming was shot by director Bryan Buckley via Hungry Man.